This simple line drawing of a pram is coloured with yellow glaze. The word baby is below. 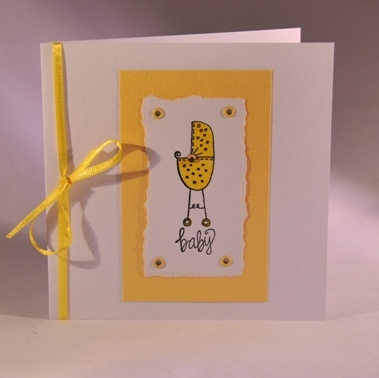 The drawing is mounted on yellow card with yellow brads and the card has a matching yellow ribbon wrapped round the spine. This card also comes in pink, green and blue. Just say which colour you want at the checkout. The card is blank inside for your own message. If ordering by phone, please reference card #142.